The hiking in the Tahoe Basin and nearby is some of the best in the world. Peaks are plentiful for the bagging, but the destination may also be one of the many lakes or waterfalls that dot the landscape. Here are links to some of the more popular hikes, as well as some of my favorites. Round Top/Carson Pass area - Huge wilderness area off Highway 88. Carson Spur to Thunder Mountain - Nice trail to great scenery off Highway 88. Woods Lake - Also an entry point to the Round Top/Mokelumne Wilderness Area. Stevens Peak - Great scenic skiing. Hawkins Peak - The shortest of the Ten Grand club. Emigrant Basin/Melissa Coray Peak From Kirkwood. Thunder Bowl to Silver Lake - From Kirkwood. Potholes - Unique swimming holes. Great for Kids! Jobs Peak - 6,000' from the valley floor to the peak. Mt. Tallac - The old standby on the South Shore. Jakes Peak - Outstanding Lake Tahoe views on this tour. Pyramid Peak - There are no easy options here. Ralston Peak - Nice consistent hike to great views. Maggies Peaks (video) - Straight up and up to a nice lake. Angora Lakes - Short and sweet. Great for Kids! Taylor Creek - Interpretive trails or rugged hike. Great for Kids! Fallen Leaf Lake - Short hike to the North Shore. Great for Kids! Upper Truckee River - More information about the river than about hiking. Horsetail Falls - If Risk=Reward you'll get lots of both here. 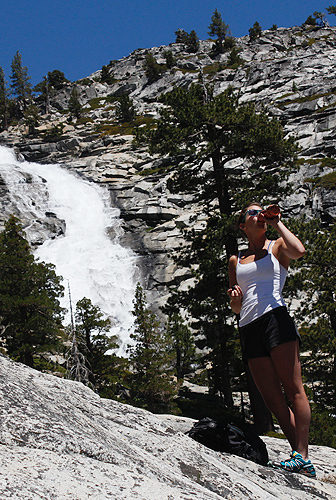 Eagle Falls - Also takes you to Vikingsholm. Great for Kids! Emerald Bay - Vikingsholm - Also takes you to lower Eagle Falls. Great for Kids! Skunk Harbor - Short hike to a secluded east shore beach. Great for Kids! Glen Alpine Falls - No hiking necessary, but it's there if you want it. Echo Peak - From Angora Lakes this is a great way to spend a short day. Flagpole Peak - Awesome backcountry skiibg and rewarding summer hike. Freel Peak - Tallest on the South Shore. Monument Peak to Gardnerville - 5,000 foot vertical of untracked. Trimmer Peak - A South Shore hidden gem. Waterhouse Peak - South Shore favorite. Easy access in and out. Mount Rose - Longish hike from Mount Rose summit (the road). Relay Peak - Long skin in to not much terrain. Rubicon Peak - Easy skin in to a safe tour. Sierra Buttes - North of Truckee off Yuba Pass. Stunning views all along the hike. Mount Dana - Hopefully the first of many Yosemite hikes. Mount Whitney - Wow!!! That's all I can say. Mount Conness - Beautiful area on the edge of Yosemite. Accessed from Saddlebag Lake. We provide this information as a free service. All we ask is that you follow these terms of service. Click here for additonal hiking, skiing, and backcountry links. Also check out the Tahoe Rim Trail for useful info.